‘What are you grateful for?’ our plates ask us as we lift up forkfuls of raw lasagna with basil hempseed pesto and cashew ricotta cheese. We are at Café Gratitude in downtown Los Angeles. Expressing gratitude for what we eat is a daily ritual in many cultures. Food is the essence of life, and we are what we eat. The menu is plant-based, 100 percent organic and a lot of the produce is sourced from the owners’ 21-acre farm in northern California. The food oozes health and wellbeing. Ingredients like kelp, shredded kale, and garlic tahini satiate our palates and most of what we have ordered is delicious and satisfying. Only the crusty, gluten-free bread accompanying the entree turns out to be from Whole Foods, a large high-end supermarket. Light floods the sparse interior consisting of white-painted metal stools and chairs and distressed wood. 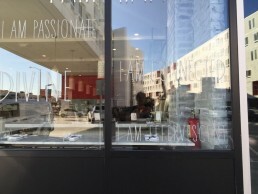 The glass windows at the entrance firmly proclaim in minimalistic font ‘ I AM PURE’, ‘I AM FORTIFIED’, ‘I AM COOL’. This self-affirming typographic treatment extends all around the interior and cascades onto the menus and other branding collateral. The entrance is painted a vivid green and the rough edged font used for Café Gratitude is faintly reminiscent of a Cooper, with generous curved serifs. Branding is all about connecting us to an object, service or product at an emotional level. 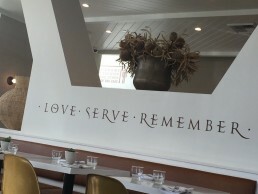 And Cafe Gratitude in Los Angeles does precisely that. In the bright California sunshine, answering that question seems just the right soul-searching kind of thing to do. 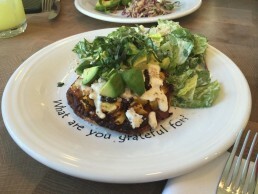 Café Gratitude’s over-the-top affirmations have sometimes been slammed in the social media. Their business ethics have been questioned and a lawsuit even led to the closing down of all their popular San Francisco eateries. Yet their Los Angeles outlets are flourishing and the brand resonates with yuppies and those who strive to eat green and healthy. We now live our lives unselfconsciously in the public eye. Like the emoticons recently introduced by Facebook and the mood-of-the-moment selfies we send each other, at Café Gratitude, feelings are to be aired in the open. Based in Hong Kong – mostly – Deepa travels the world and writes about what interests her and its influences on her design work.